A crunchy Crumb Crust is a cooking technique that I use for a lot of my recipes. This delicious crust can form the bottom layer of bar and cheesecake recipes and can take the place of a pie crust anytime you don’t want a double pie crust dessert. Don’t know how to make a crust like this? Just follow my cooking tips step by step and you’ll have a delicious base for your next dessert done and ready for your sweet toppings. I use crumb crusts all the time in baking. Sometimes, I use it just on the bottom and other times (like these maple syrup date bars) I use it on both the bottom and the top of the recipe. Crumb crusts are also MUCH easier to make than a standard pie crust. 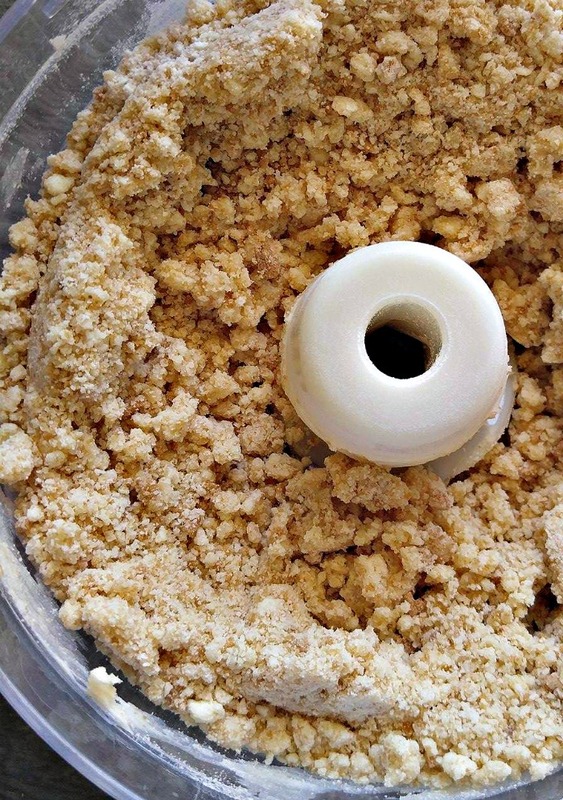 If you have a food processor and a few ingredients, you can make a crumble crust in just seconds. A heavy marble rolling pin also works well. Just put the ingredients in a zip lock baggie and crush them this way. What is a crumble crust? Basically a crumb crust (or crumble crust) is made from three ingredients: Butter, Sugar of some sort, and 1 other ingredient. The beauty of a crumb crust is that you can decide what that third ingredient is depending on what else you want to put on top of the crust. Crumble crusts are very adaptable to other ingredients. Here are a few ideas for adapting the basic crumb crust. Will you have chocolate chips swimming in the topping? Try an Oreo Cookie based crust like one for these Oreo Mint Cheesecake bars. Crumb crusts pair really well with a streusel topping. Use Flour in your crumb crust for this pairing. Will your toppings have a salty taste? Try making the crust with pretzels. These no bake peanut butter pretzel bars show how great it tastes. Want a traditional crumb crust? Use Graham crackers. I love the way it is used with these mini cherry cheesecakes! Use oatmeal for a hearty crust. It goes great with these caramel apple bars. 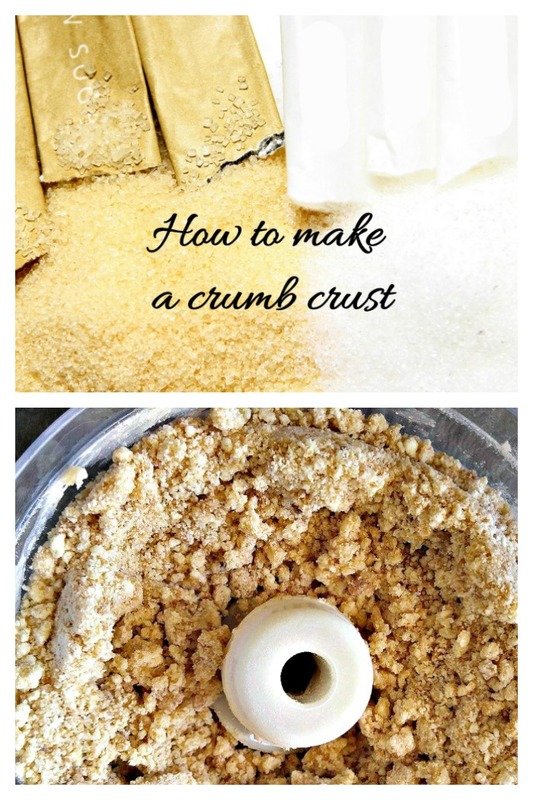 Let’s make a simple crumb crust! 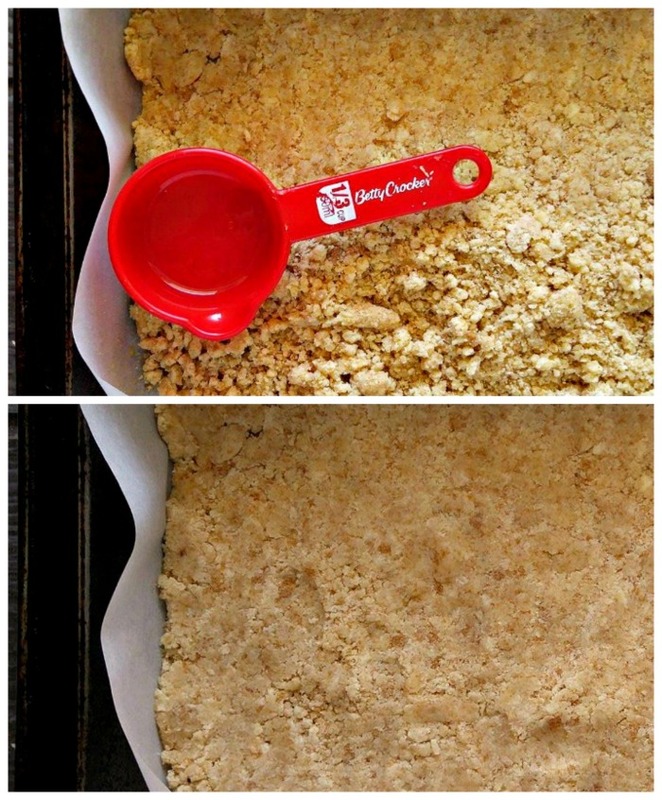 Want to see how easy it is to make a crumble crust recipe? 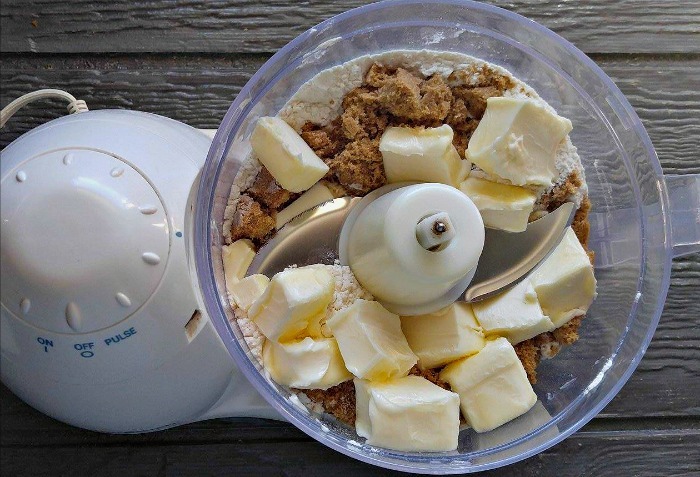 Just dump all of the ingredients into a food processor. I cut my butter into cubes and make sure that it is at room temperature. 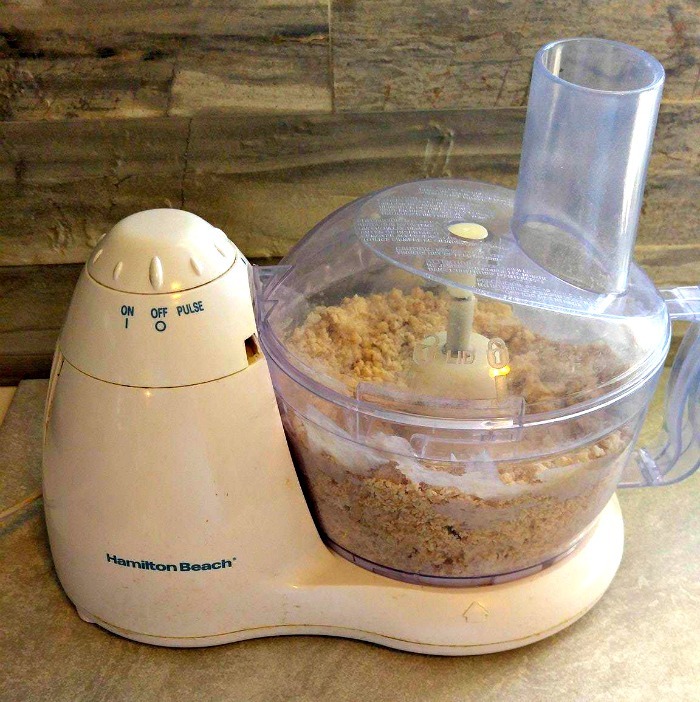 A few pulses with the food processor and, a few seconds later, the flour and brown sugar combine to make a wonderful mixture that is just perfect to use in bars. Butter at room temperature will be easily incorporated into the brown sugar and flour making a coarse corn meal type of texture with a few larger clumps in it. Trying not to taste it right now is a challenge! Press the mixture into a pan that is lined with parchment paper and sprayed with some non stick cooking spray. I use a Misto sprayer. Using a sprayer like this allows me to add whatever oil I would like and it is SO much cheaper than buying a store bought non stick spray. 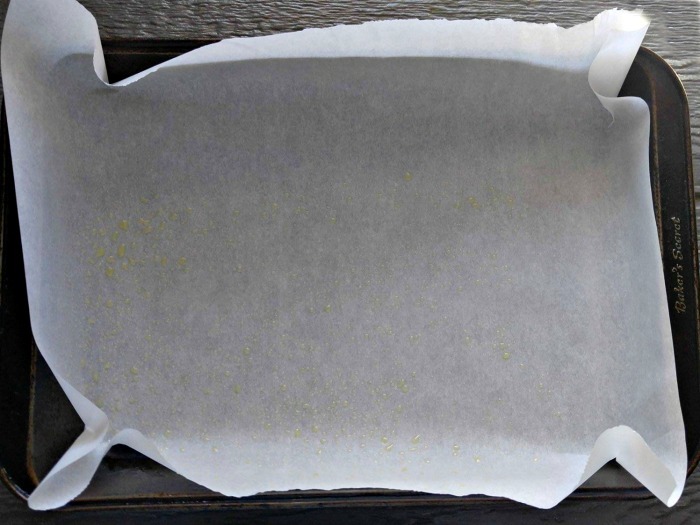 The parchment paper will make it easier to remove the crust after it is cooked and topped. The bottom of a small measuring cup will press the mixture down evenly. All that is left to do is the cook the crumb crust in a 350 º oven for 20 minutes. The crust puffs up a little and turns a light golden brown. Once it is cooled, you can add whatever you would like to for toppings. This type of crust is perfect for fruit desserts but can also be used in lots of other ways. My latest crumb crust got a layer of cheesecake as well as some cinnamon apples and a streusel topping and they were amazing! 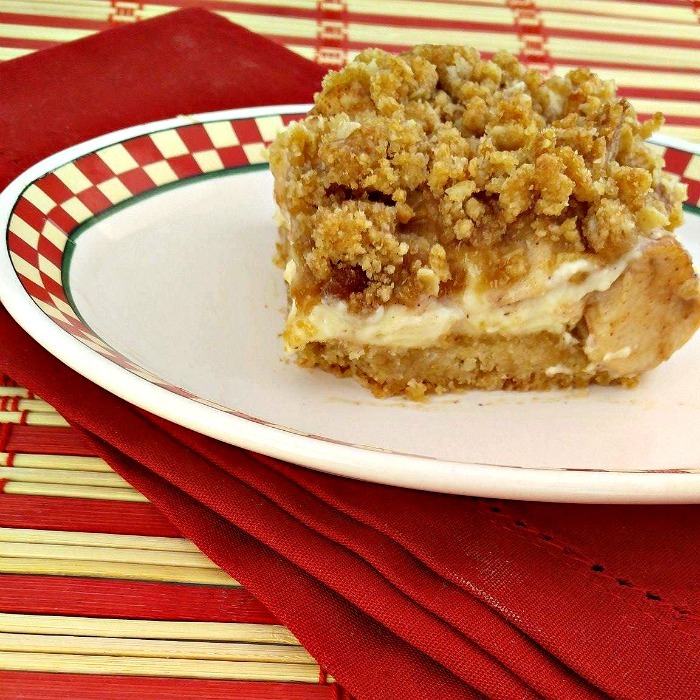 See the apple cheesecake bars recipe here. How will you adapt your crumb crust today? Tell us in the comments below. For more Cooking Tips, be sure to visit my Cooking Tips and Kitchen Tips board on Pinterest. Would you like a reminder of this post? Pin this image to one of your cooking boards on Pinterest. 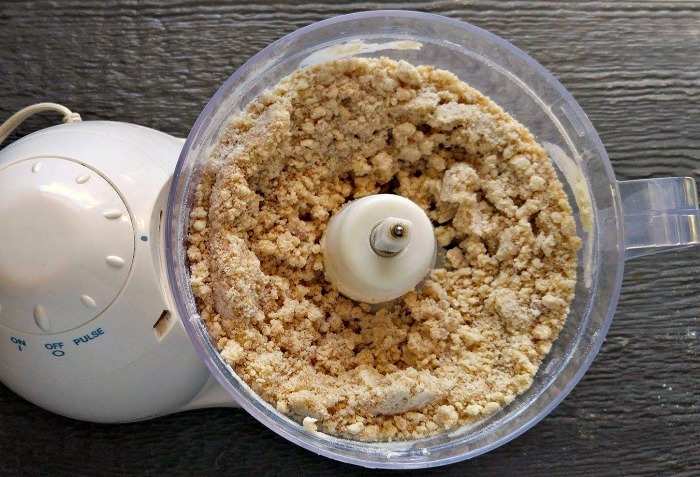 Add all of the ingredients in a food processor. Pulse for a few seconds until the mixture resembles coarse corn meal. Press the crust mixture into the bottom of a 9 x 13" pan. Bake for 20 minutes in a preheated 350º oven. Add any toppings you would like to finish the crust. Note: The photos in the tutorial show both white and brown sugar. You can use 1/2 cup of either. 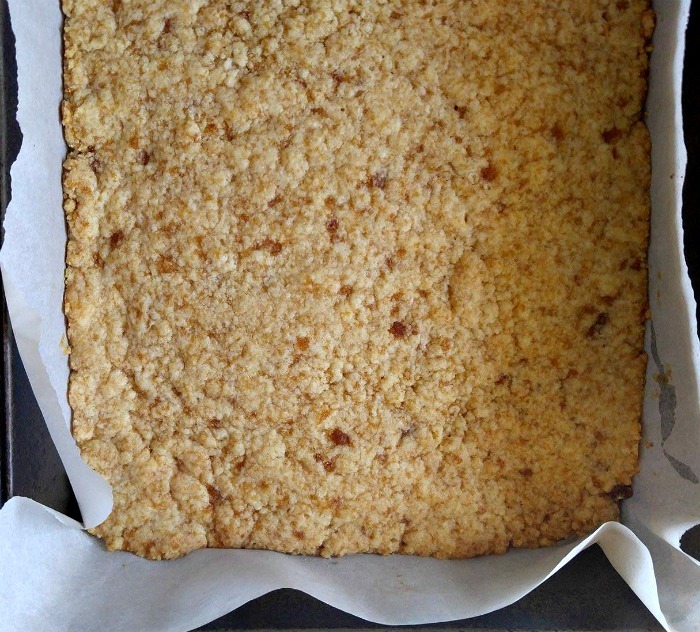 I’m trying to find a way to make crust for fruit bars-one that will ‘hold up’ , that is, will stay firm enough to be able to cut it without it crumbling. mine always fall apart ! I’m confused about the ingredients. 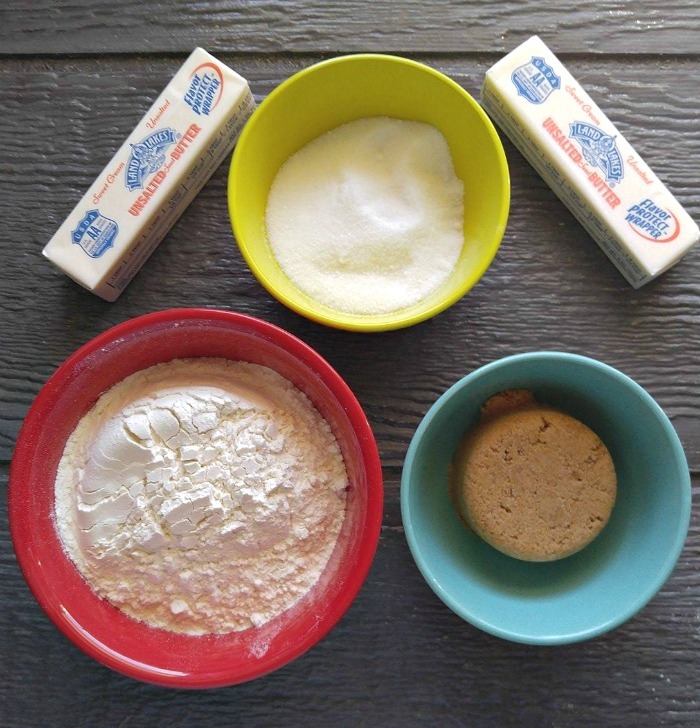 In the ingredients photo it shows butter, flour, white sugar and brown sugar. Below that you list: 1 cup of brown sugar, 1 cup of butter and 2 cups of flour. Then in the recipe card it says half a cup of brown sugar, 1 cup of butter and 2 cups of flour. Can you please clarify?